More groups and individual people are fighting against the big biotech companies. 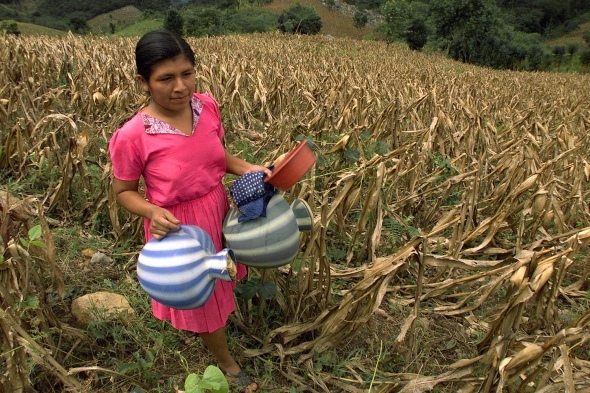 A small group of Mexican beekeepers have stopped Monsanto from planting thousands of hectares of GM soybeans. A judge in Yucatán cancelled the permission the government had already given to Monsanto (allowing them to plant Roundup Ready soybeans on 253,000 hectares). Scientific evidence that GM soy crops are dangerous for honey production convinced the judge. Monsanto uses glyphosate pesticide and this damages the environment, soil, water and groups of bees. Mexico exports a lot of honey to Europe, and people would stop buying it if the honey has GM pollen. It was because of ten days of protests by many indigenous people, trade unions, farmers’ and women’s groups. In September 2014, the Guatemalan Congress cancelled the ‘Monsanto law’ – the whole country hated it. Under this law, all farmers grow corn and beans from natural seeds would be criminals. If these natural seeds had contamination from GM seeds from insect pollination or wind, the farmers would have to buy a licence for seed from a big company (eg. Monsanto) or go to court. It was because of European activists that the European Patent Office took away a Monsanto patent for tomatoes in December 2014. The activists, from No Patents on Seeds! noticed a patent: Monsanto was saying that tomatoes with a natural resistance to a fungal disease (botrytis) was a new GM invention. Zen Honeycutt is the mother of three children. One of her children has allergies that are so bad she could die of them. The allergy and autism symptoms were not so bad when she gave her children organic food and stayed away from GMOs and pesticides. In 2012 she started Moms Across America to find with mothers with similar experiences. In 18 months the mothers had more than 400 meetings in a new national campaign for freedom from GMOs. In January 2015, Honeycutt was one of the activists who spoke at Monsanto’s annual shareholders meeting. She told CEO Hugh Grant: ‘Please stop this. Stop poisoning our children.’ At the same meeting digital activists Sum-of-Us asked Monsanto’s CEO to open up Monsanto information to an independent chair of the board of directors. And As You Sow said that Monsanto must make public all the lobbying payments (money Monsanto paid to help get support). ‘If my grandfather was alive, he would hate it!’ writes Pamela Boakye. She comes from a farming family in Ghana. She supports the campaign by farmers, fishers and others against the new Plant Breeders Bill (the ‘Monsanto Law’) there. This law would make it illegal for traditional farmers to save and exchange seed. Also, it would force them to pay money to big seed companies like Monsanto. The government tried to pass this law during the World Cup, hoping no-one would notice. But farmers, fishers and campaigners saw this and got together in Food Sovereignty Ghana to fight it. There is international support eg. from the British charity Global Justice Now. Their email campaign got 80 British MPs to promise not to support the ‘Monsanto Law’ (from the British- and US-backed New Alliance for Food and Security Programme). The fight has not finished yet. Steve Marsh is an Australian organic farmer. He is brave enough to fight against Monsanto and keep fighting. He is getting more and more supporters. Steve comes from a farming community in Kojonup, Western Australia. In 2010, the state government stopped the ban on GM canola (rapeseed). Steve’s neighbour started growing Monsanto canola. The wind blew some of the seed onto Steve’s fields. So there was 70-per-cent contamination and Steve lost his organic certification. Monsanto takes no responsibility for this (every GM farmer has to sign a no-liability agreement). Steve decided to fight for his right to farm with no GM crops and took this to court. He lost in May 2014. And now he has to pay hundreds of thousands of dollars - legal costs and fees. But he has appealed. And Australia’s Food Foundation is raising money and support. This is an important test case. Vandana Shiva has been fighting for many years for biodiversity, seed and food sovereignty. She has been fighting against the control of big companies like Monsanto. She has said many times that Monsanto’s seed patents are making Indian farmers poor. So people attack her. NOW READ THE ORIGINAL: http://newint.org/features/2015/04/01/groups-against-monsanto/ (This article has been simplified so the words, text structure and quotes may have been changed). This page was last edited on 21 April 2015, at 21:07.